A warm friendly welcome awaits you at this former 17th Century farmhouse. 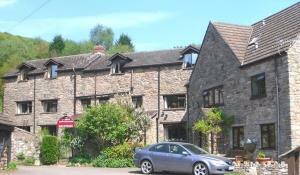 This small family run hotel is located just 50 yards from the banks of the River Wye on the peaceful northern fringes of Tintern village. This south facing stone building, offers a high standard of comfort and relaxaton, with its large, beamed lounge, intimate restaurant, well appointed bedrooms and small, suntrap garden from which you can enjoy the stunning view of the Wye Valley. By Road: From M48 (Old Severn Bridge) follow signs for Chepstow and Tintern Abbey. Parva Hotel is at opposite end of the village to the Abbey.. Approx 3/4 mile. Train to Chepstow, Bus or taxi to Tintern.